Energetic performance of the famous Japanese group Ondekoza has sparked enthusiasm among the audience in Kolarceva zaduzbina, and the rhythmic sounds of traditional taiko drums took it briefly to the Far East. The concert was supported by the Japanese Embassy and the company Japanese Tobacco International, which also supported performance of Japanese drummers in Croatia, Bosnia and Herzegovina and Slovenia following their performance in Belgrade. 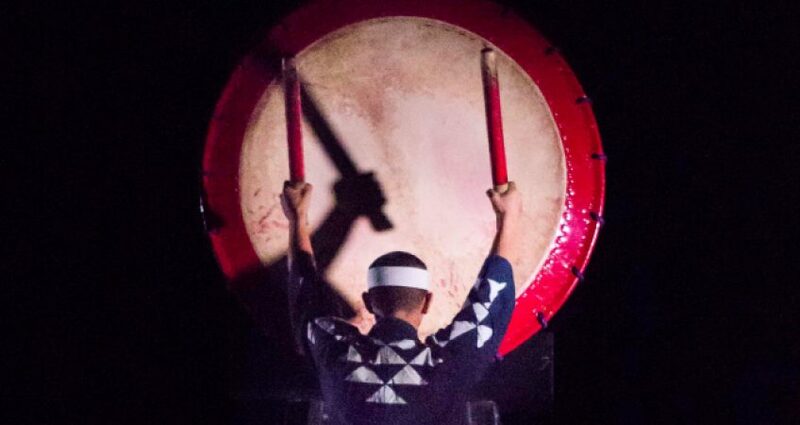 Ondekoza continually pursues greater means of expression through the use of taiko drums. By trimming the performance of all that is excessive, and playing to the limit of physical capabilities, Ondekoza believes that the sound of the drum alone is capable of striking a powerful impression. In its 42 year history, Ondekoza has been influential in spreading and popularizing taiko, particularly outside of Japan. “My impression is that the Serbian audience is very informed about the culture and that it has an exceptional way of listening, getting deep into music and the concert. We are really trying to transfer our way of work to the scene which means that by every day exercise and practicing to the limit of physical capacities, we meet and face ourselves. We are glad to see that the audience can appreciate that” said Norikazu Tomita, member of Ondekoza. “Ondekoza is the first Japanese drummers group which started the concert performance and actively performed not only in Japan, but also in America, Europe and other parts of the world. Their rhythm of Japan is widely recognized around the world, and that is the reason why I believe that this concert will contribute to initiation of exchange of culture between our two countries. This concert was organized thanks to the company Japan Tobacco International which is celebrating 10 years of production in Serbia. JTI contributed to improvement of the Serbian economy by opening new job positions, increased export and continuously helping exchange of culture and academies between our two countries. I would like to use this opportunity to thank the company Japan Tobacco International for contribution in strengthening bilateral relations between Japan and Serbia” said HE Juici Takahara, Japanese Ambassador in Serbia. Ondekoza was formed in 1969 on the Japanese island of Sado where its founder, Den Tagayasu gathered a group of young men and women willing to follow his ideals. At the foundation of Ondekoza’s activity is the principle of “Sogakuron”- that “running and drumming are one, and a reflection of the drama and energy of life. Ondekoza members live together in the village Higashi Čičibu, Japan, where they start each day at 6 am with a 10km run. They believe that the daily routines of life are reflected in the creative expression of stage performance and by running, studying and living together, Ondekoza aims to train the body and mind of its members. The greatest attention attracted their marathon tours, organized in China and the US, during which the drummers ran from city to city, in some cases even coming out on the stage directly after the end of the race. Performances in the region were sponsored by the company Japan Tobacco International (JTI), the leading corporate promoter of Japanese culture and tradition which every year presents Japanese artists to local audiences together with the Japanese Embassy. In recent years the JTI supported performances of Gocoo drummers, traditional Wariki group, famous pianist Fujiko Hemming, and many other renowned Japanese artists.